This is an old revision of this page, as edited by 68.188.224.187 (talk) at 02:43, 26 November 2016 (→‎Use in Hollywood productions). The present address (URL) is a permanent link to this revision, which may differ significantly from the current revision. Logo for IMAX used since 1970. IMAX (an acronym for Image maximum) is a motion picture film format and a set of cinema projection standards developed in Canada by Graeme Ferguson, Roman Kroitor, Robert Kerr, and William C. Shaw. IMAX has the capacity to record and display images of far greater size and resolution than conventional film systems. Since 2002, some feature films have been converted (or upgraded) into IMAX format for displaying in IMAX theatres and some have also been partially shot in IMAX. IMAX is the most widely used system for special-venue film presentations. As of June 2016, there were 1,102 IMAX theatres in 69 countries. The desire to increase the visual impact of film has a long history. In 1929, Fox introduced Fox Grandeur, the first 70 mm film format, but it quickly fell from use. In the 1950s, the potential of 35 mm film to provide wider projected images was explored in the processes of CinemaScope (1953) and VistaVision (1954), following multi-projector systems such as Cinerama (1952). While impressive, Cinerama was difficult to install. During Expo 67 in Montreal, the National Film Board of Canada's In the Labyrinth and Ferguson's Man and the Polar Regions both used multi-projector, multi-screen systems. Each encountered technical difficulties that led them to found a company called "Multiscreen", with a goal of developing a simpler approach. The single-projector/single-camera system they eventually settled upon was designed and built by Shaw based upon a novel "Rolling Loop" film-transport technology purchased from Peter Ronald Wright Jones, a machine shop worker from Brisbane, Australia (see U.S. Patent 3,494,524). As it became clear that a single, large-screen image had more impact than multiple smaller ones and was a more viable product direction, Multiscreen changed its name to IMAX. An IMAX 3D theatre also is in operation near the former Expo 67 site at the Montreal Science Centre in the Port of Old Montreal. During Expo '74 in Spokane, Washington, an IMAX screen that measured 27 m × 20 m (89 ft × 66 ft) was featured in the US Pavilion (the largest structure in the expo). It became the first IMAX Theatre to not be partnered with any other brand of movie theaters. About five million visitors viewed the screen, which covered the viewer's total visual field when looking directly forward. This created a sensation of motion in most viewers, and motion sickness in some. Much to the dismay of the majority of Spokane and the disapproval of the IMAX Corporation itself, it will be demolished to make way for a parking lot. Another IMAX 3D theater was also built in Spokane, not too far from where the original was. However, it's screen-size is less than half that of the Pavilion screen. In 2008, IMAX extended their brand into traditional theaters with the introduction of Digital IMAX, a lower-cost system that uses two 2K digital projectors to project on a 1.89:1 aspect ratio screen. This lower-cost option, which allowed for the conversion of existing multiplex theater auditoriums, helped IMAX to grow from 299 screens worldwide at the end of 2007 to over 1,000 screens by the end of 2015. As of June 2016 there were 1,102 IMAX theaters located in 69 countries, of which 990 were in commercial multiplexes. The IMAX cinema process increases the image resolution by using larger film frame; in relative terms, a frame of IMAX format film has three times the theoretical horizontal resolution of a frame of 35mm film. To achieve such increased image resolution, which IMAX estimates at approximately 12 thousand lines of horizontal resolution (12K), 65mm film stock passes horizontally through the IMAX movie camera, 15 perforations at a time. At 24 frames per second, this means that the film moves through the camera at 102.7 metres per minute (just over 6 km/h). In a conventional 65mm camera, the film passes vertically through the camera, five perforations at a time, or 34 metres per minute. In comparison, in a conventional 35mm camera, 35mm film passes vertically through the camera, at four (smaller) perforations at a time, which translates to 27.4 metres per minute. In the Todd-AO 70mm-format of widescreen cinema, the image area of a 65mm film-frame is 48.5 mm × 22.1 mm (1.91 in × 0.87 in); in the IMAX-format of widescreen cinema, the movie image is taller than it is wide, given the film-frame dimensions of 69.6 mm × 48.5 mm (2.74 in × 1.91 in). To match the standard image resolution of the moving image produced with the film-speed of 24 frames per second, an IMAX film requires three times the length of (negative) film stock required for a 65mm film of comparable scope and cinematic technique. In 2011, IMAX announced a 4K 3D digital camera with the similar wide resolution of regular IMAX film cameras. The camera was developed alongside Vision Research and AbelCine, integrating two Phantom 65 engines. A prototype camera was used for the documentary Born to be Wild, in which approximately 10% of the finished film was shot with the system. It has been said that the company has no intention of replacing the higher resolution film cameras with the new digital camera, but the latter can be used in scenes that require a lightweight or relatively small 3D camera in order to film it without issue. While IMAX has completed the production camera and has been placed into service on several films, there are no plans to produce an IMAX film using solely the new digital system. Transformers: Age of Extinction is the first feature film to be partially filmed with the Phantom 65 IMAX 3D camera. In 2015, IMAX announced a 2D digital camera that was developed alongside Arri, the camera being based on the latter company's Arri Alexa 65 technology. The first production to use the camera is Captain America: Civil War. Directors Joe and Anthony Russo have announced that both parts of Avengers: Infinity War will be filmed completely with IMAX 2D digital cameras. The IMAX format is generically called "15/70" film, the name referring to the 15 sprocket holes or perforations per frame. The film's bulk requires horizontal platters, rather than conventional film reels. IMAX platters range from 1.2 to 1.83 meters (3.9 to 6.0 ft) diameter to accommodate 1 to 2.75 hours of film. Platters with a 2.5 hour feature film weigh 250 kilograms (550 lb). IMAX uses ESTAR-based print film in their 15/70 rolling-loop film projection systems. ESTAR-based print film provides greater precision. The chemical development process does not change the size or shape of ESTAR print film, and IMAX's pin registration system (especially the camera mechanism) does not tolerate either sprocket-hole or film-thickness variations. On September 1, 2016, it announced plans to include Virtual Reality into the IMAX theater experience with the opening of a new VR center in Los Angeles using a new StarVR headset created by Acer. In order to use more of the image area, IMAX film does not include an embedded soundtrack. 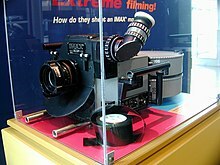 Instead, the IMAX system specifies a separate six-channel 35 mm (1.4 in) magnetic film, recorded and played back on a film follower locked to picture, just as Vitaphone had been (utilizing 16-inch 33 1/3 RPM electrical transcription discs) in the early 20th century, and was the same technology used to provide the 7-channel soundtrack accompanying films photographed and exhibited in the Cinerama process in the mid-1950s. By the early 1990s, a separate DTS-based 6-track digital sound system was used, similarly locked to the projector by a SMPTE time code synchronization apparatus, the audio played off a series of proprietarily encoded CD-ROM discs. In the late 1990s this system was upgraded to one using a hard drive which carries a single uncompressed audio file containing the 6 channels. These are then converted directly to analogue rather than using a decoding method such as DTS. Drawing the large film through the projector presented challenges for both the camera and the projector. Conventional 70 mm systems were not steady enough for the 586× magnification. On the projector side, William Shaw adapted an Australian patent for film transport called the "rolling loop" by adding a compressed air "puffer" to accelerate the film, and put a cylindrical lens in the projector's "aperture block". The projector uses a vacuum to pull the film into contact with this lens. Thus the "field flattener" flattens the image field. The lens is twice the height of the film and connects to a pneumatic piston so it can be moved up or down while the projector is running. This way, if a piece of dust comes off the film and sticks to the lens, the projectionist can switch to the clean side of the lens at the push of a button. The lens also has "wiper bars" made of a felt or brush-like material which can wipe dust off the lens as it moves up or down. IMAX projectors are pin stabilized, meaning four registration pins engage the perforations at the corners of the projected frame to ensure perfect alignment. Shaw added cam-controlled arms to decelerate each frame to eliminate the microscopic shaking as the frame "settled" onto the registration pins. The projector's shutter is open around 20% longer than in conventional equipment and the light source is brighter. The xenon short-arc lamps are made of a thin layer of fused quartz and contain xenon gas at a pressure of about 25 atmospheres (367 PSI); because of this, projectionists are required to wear protective body armor when changing or handling these in case the lamp breaks (e.g., due to a drop to the floor) because of the danger from flying quartz shards when propelled by the high pressure of the xenon gas within. An IMAX projector weighs up to 1.8 tonne (2 short tons) and is over 178 cm (5.8 ft) tall and 195 cm (6.4 ft) long. The digital cinema IMAX projection system, debuted in 2008, is designed to be used with shorter 1.89:1 aspect ratio screens. The system uses two 2K projectors that can present either 2D or 3D content in DCI or IMAX Digital Format (IDF) (which in itself is a superset of DCI). IDF initially used 2K-resolution Christie xenon projectors, with a Texas Instruments Digital Light Processing (DLP) engine, but in 2012 IMAX announced that they would be switching to Barco as their primary supplier. The two 2K images are projected superimposed on each other with a half-pixel offset, using super-resolution imaging to increase the perceived resolution to approximately 2.9K. For 3D presentations, one projector is used to display the image for each eye, while 2D presentations use the superimposed images to allow for a brighter 22-foot lambert image. The Digital IMAX projection system includes a proprietary IMAX Image Enhancer that modifies the output of the digital media server based on feedback from cameras and microphones in the auditorium, and maintains alignment with sub-pixel accuracy. Mainly because the system facilitates inexpensive distribution of IMAX features, the company announced in February 2012 that they were re-renovating specially selected locations around the world to present both 70mm analog as well as digital presentations. To do so, IMAX developed a rail system that allows the projectors to be moved in and out if there is either a full-frame film print available or a digital-only release. These theaters were prepared in time for the release of The Dark Knight Rises in July 2012. In April 2012, IMAX began testing a new 4K laser projection system, based on patents licensed from Eastman Kodak. Like the 3D film and digital systems, it used two projectors, but it improved over the smaller digital screens by retaining the traditional IMAX aspect ratio and to allowed films to be shown on screens 36 m (118 ft) wide or more. In December 2014, IMAX began rolling out its new Dual 4K laser projector system, dubbed "IMAX with Laser", with the first installation occurring at the Cineplex ScotiaBank Theatre in Toronto. The system allows digital projection on the full 1.43:1 aspect ratio surface of a traditional IMAX screen, but can also be used on wider screens such as the 2.00:1-aspect-ratio TCL Chinese Theater. The system replaces the xenon arc lamp of a traditional digital projector with a laser light source, and is capable of 60 fps with "50 percent greater" brightness than the Digital Cinema Initiatives spec, a contrast ratio "double" that of IMAX 15/70mm film projection and "higher" than the 2500:1 contrast ratio of IMAX's xenon lamp-based projection systems, and displaying the full Rec. 2020 color gamut/space. The system also features a new 12-channel surround sound system, which adds an additional speaker on either side of the theater as well as four new overhead speakers. While still not matching the theoretical resolution of traditional IMAX film, which is estimated to be up to 12 thousand lines of horizontal resolution on the 65mm camera negative (12K) and approximately 6 thousand on a 35mm release print (6K), the new laser system features dual-4K resolution projectors, each capable of displaying four times the detail of one Digital IMAX projector. Like Digital IMAX, images from the two projectors are projected superimposed on each other with a half-pixel offset, using super-resolution imaging to increase the perceived resolution to be greater than 4K. In-theater cameras and microphones are used to automatically calibrate the projectors and sound system between showings. For 3D presentations, one projector is used to display the image for each eye, while 2D presentations use the superimposed images to allow for a brighter image. A standard IMAX screen is 22 m × 16.1 m (72 ft × 53 ft), but can be significantly larger. The world's largest IMAX screen was in Darling Harbour, Sydney, Australia, and measured 35.72 m × 29.57 m (117.2 ft × 97.0 ft). The current largest IMAX screen is in Melbourne Museum, Australia and measures 32 m × 23 m (105 ft × 75 ft). In the late 1960s the San Diego Hall of Science (now known as the Reuben H. Fleet Science Center) began searching North America for a large-format film system to project on the dome of their planned 23.16 m (76.0 ft) tilted dome planetarium. 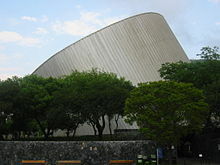 The standard IMAX projector was unsuitable for use inside a dome because it had a 3.65 m (12.0 ft) tall lamp house on top. IMAX Corporation redesigned its system, adding an elevator to lift the projector to the center of the dome from the projection booth below. Spectra Physics designed a suitable lamphouse that took smaller, 46 cm (18 in) lamps and placed the bulb behind the lens instead of above the projector. In 1970, Ernst Leitz Canada, Ltd. (now ELCAN Optical Technologies) won a contract to develop and manufacture a fisheye lens projection system optimized to project an image onto a dome instead of a flat screen. 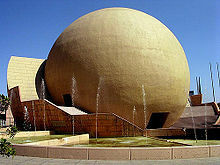 The dome system, which the San Diego Hall of Science called OMNIMAX, uses films shot with a camera equipped with a fisheye lens that squeezes a highly distorted 180° field of view onto the 65 mm IMAX film. The lens is aligned below the center of the frame and most of the bottom half of the circular field falls beyond the edge of the film. The part of the field that would fall below the edge of the dome is masked. When filming, the camera is aimed upward at an angle that matches the tilt of the dome. When projected through a matching fisheye lens onto a dome, the original panoramic view is recreated. OMNIMAX wraps 180° horizontally, 100° above the horizon and 22° below the horizon for a viewer at the center of the dome. OMNIMAX premiered in 1973 showing Voyage to the Outer Planets (produced by Graphic Films) and Garden Isle (by Roger Tilton Films) on a double bill. IMAX has since renamed the system IMAX Dome. However, some theatres continue to call it OMNIMAX. OMNIMAX theatres inhabit theme parks and North American museums, particularly those with a scientific focus, where the technical aspects of the system may be highlighted as part of the attraction. The projection room is often windowed to allow public viewing and accompanied by informational placards like other exhibits. The screen may be a permanent fixture, such as at the Museum of Science and Industry in Chicago, Illinois; Carnegie Science Center in Pittsburgh, Pennsylvania; the Franklin Institute in Philadelphia, Pennsylvania; the St. Louis Science Center; Boston's Museum of Science; Richmond's Science Museum of Virginia; Birmingham, Alabama's McWane Science Center and US Space and Rocket Center in Huntsville, AL; the Cincinnati Museum Center at Union Terminal and Great Lakes Science Center in Cleveland, OH; or lowered and raised as needed, such as at the Canadian Museum of History (where it shares an auditorium with a standard IMAX screen). The entire dome can be raised to show flat screen features and lowered for dome features. For the flat screen theaters, before the feature begins, the screen can be backlit to show the speakers and girders behind it. While the majority of museum installations focus on educational and documentary films, on special occasions, entertainment films are also shown, such as Charlie and the Chocolate Factory at the Oregon Museum of Science and Industry. The largest in North America are at Liberty Science Center in Jersey City, New Jersey and the Telus World of Science in Vancouver, BC, both of which have dome screens 27 metres (89 ft) in size. To create the illusion of depth, the IMAX 3D process uses two separate camera lenses that represent the left and right eyes. The lenses are separated by a distance of 64 mm (2.5 in), the average distance between a human's eyes. Two separate rolls of film are used to capture the images they produce. 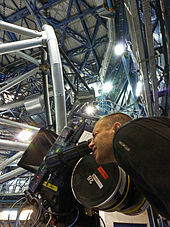 The IMAX 3D camera weighs over 113 kg (249 lb). By projecting the two films superimposed on the screen and using one of several available methods to direct only the correct image to each eye, viewers see a 3D image on a 2D screen. One method is to use polarizing filters to oppositely polarize the light used in projecting each image. The viewer wears glasses with polarizing filters oriented to match the projector filters, so that the filter over each eye blocks the light used to project the images intended for the other eye. In another method, the two projections rapidly alternate. While one image is being shown, the projection of its mate is blocked. Each frame is shown more than once to increase the rate and suppress flicker. The viewer wears shutter glasses with liquid crystal shutters that block or transmit light in sync with the projectors, so each eye sees only the images meant for it. Because 70mm film and projectors are costly and difficult to mass produce, and because the size of auditoriums that house full-size IMAX screens make them expensive to construct, IMAX debuted a digital projection system in 2008 designed to be used with shorter 1.89:1 aspect ratio screens. It uses two 2K-resolution projectors that can present either 2D or 3D content in DCI or IMAX Digital Format (IDF) (which in itself is a superset of DCI). The digital installations have caused some controversy, as many theaters have branded their screens as IMAX after merely retrofitting standard auditoriums with IMAX digital projectors. The screen sizes in these auditoriums are much smaller than those in the purpose-built auditoriums of the original 15/70 IMAX format, and are limited to the 1.89:1 aspect ratio. Another disadvantage is the much lower resolution of digital IMAX. The technology has a maximum perceived resolution of 2.9K, compared to traditional IMAX 70mm projection, which has an estimated resolution of 12K. Some reviewers have also noted that many non-IMAX theaters are projecting films at 4K resolution through competing brands such as Dolby Cinema and UltraAVX. 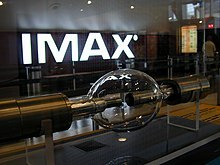 IMAX has held to a uniform branding of "The IMAX Experience" across various underlying technologies and screen sizes. Some have criticized the company's marketing approach. Despite the differences with digital IMAX, the cost-effective format has aided in the company's worldwide growth, especially in Russia and China. In May 2016, IMAX announced the test launch of IMAXShift, a multimedia Indoor cycling concept. IMAX in the USA has mostly been used for specialty applications. The expense and logistical challenges of producing and presenting IMAX films have led to approximately 40 minute shorter running times than conventional films. Most are documentaries suited for institutional venues such as museums and science centers. IMAX cameras have been used while orbiting the earth, climbing Mount Everest, exploring the bottom of the Atlantic Ocean, and visiting the Antarctic. A film about the Mars Exploration Rovers, titled Roving Mars (2006), used exclusive data[clarification needed] from the rovers. An early attempt at presenting mainstream entertainment in IMAX was The Rolling Stones: Live at the Max (1991), an 85-minute compilation of concert footage filmed in IMAX during the band's 1990 Steel Wheels tour, edited to give the impression of a single concert. In the 1990s more entertainment short films were created, notably T-Rex: Back to the Cretaceous in 1998 and Haunted Castle in 2001 (both in 3D). In 1995, French director Jean-Jacques Annaud directed Wings of Courage, the first dramatic picture shot for IMAX. In 1998 and 1999, More and The Old Man and the Sea became the first short films produced using the IMAX format and both earned Academy Award nominations, with Old Man and the Sea winning (the only IMAX film to win an Oscar). In 2000, Disney produced Fantasia 2000, the first full-length animated feature initially released exclusively in the IMAX format. Before the end of the 1990s, theatrical features were deemed impossible to run in the IMAX venues at the time, as there was a technical limitation on the size of the film reel where films had to be run around two hours. Originally IMAX and Pixar were considering to release Toy Story in IMAX 3D, but the results of the tests displayed that the render resolution could not match to the size of the IMAX image. DreamWorks in the early 2000s wanted to re-release Shrek in IMAX 3D, but this too was canceled as a result of creative changes in the studio. These failed attempts at re-releases did inspire IMAX to experiment and improve their ability in presenting computer-animation in their theaters. Their compilation CyberWorld was the result, which contained new original animation and IMAX-presented versions of computer animated tests and music videos. Cyberworld even presented open-matte 3D versions of the bar sequence from Antz and the "Homer3" segment from The Simpsons, both coincidentally were animated at Pacific Data Images. Walt Disney Pictures became the first studio to release theatrical films in the IMAX process. Released on New Year's Day in 2000, Fantasia 2000 was the studio's first IMAX release and the first theatrical feature to be presented in IMAX theaters. It was originally planned as a standard theatrical release, but in agreeing with the company to release the film, the IMAX sound system incorporated a multi-channel and multi-layer stereo system for the orchestrated soundtrack, similar to the Fantasound system Walt Disney had envisioned for the original film in 1940. The company agreed to Disney's terms and conditions to gain the exclusive first showings of the film. These included a limited engagement of 4 months (from January 1 to April 30) and 50% of the box office receipts. Not all IMAX cinemas were prepared to accept Disney's terms to present the film; however, following the IMAX release, a standard 35mm run followed in June at regular theatres. Although Fantasia 2000 had a luke-warm financial run, the critical praise for its use of the IMAX format convinced Disney to put more releases in the giant-screen format in the pipeline. In 2002, IMAX re-issues of Beauty and the Beast and The Lion King were released in select theaters over the winter and Christmas seasons of that year. New digital masters were created from the original CAPS production files and select scenes of animation were cleaned up to make use of the high resolution IMAX film negatives. Treasure Planet was also released in select IMAX theaters and was the first theatrical film to be released in regular and IMAX theaters simultaneously. But all of these releases had underwhelming box office returns and Disney canceled later big-screen re-releases, including Aladdin. With the unveiling of the DMR process (see below), Warner Bros. Pictures especially embraced the format beginning in 2003 with the two Matrix sequels, Reloaded and Revolutions. Since The Prisoner of Azkaban in 2004, Warner Bros. began releasing the Harry Potter film franchise in IMAX to strong financial success. Also in 2004 the studio released Robert Zemeckis' motion-capture film The Polar Express in IMAX 3D. Polar Express became the most successful film to be released in IMAX theatres, producing at least a quarter of the film's gross of $302 million from fewer than 100 IMAX screens. Success for Warner Bros. and IMAX followed in later years with I Am Legend, Happy Feet, Batman Begins and The Dark Knight. Progressively other studios became further interested in releasing films in IMAX through the DMR process and have earned success through it. In 2009, J. J. Abrams's Star Trek was released for initially two weeks in IMAX venues in May and opened to $8.3 million dollars. The IMAX opening weekends of The Avengers and Harry Potter and the Deathly Hallows Part 2 have since grossed $15 million. Though they weren't filmed with IMAX cameras, Skyfall and The Amazing Spider-Man were optimized for IMAX digital screens when they were released. Both movies were filmed in high-resolution cameras and the digital negative ratio was equal to that of the IMAX Digital frame. Skyfall increased the visual information of the entire film while Amazing Spider-Man optimized the finale battle with the Lizard. James Cameron's Titanic when it was restored and re-released in theaters also specially made an open-matte version for IMAX. In 2010 after years of successful IMAX DMR releases, Warner Bros. signed a deal to release up to 20 feature films in IMAX up to 2013, including educational documentaries that were in production. In May 2015, it was announced that Marvel Studios's two-part film, Avengers: Infinity War, will be filmed entirely in IMAX, the first Hollywood feature film to do so, using a modified version of Arri's Alexa 65 digital camera. The camera is set to be used first to film select sequences in another Marvel production, 2016's Captain America: Civil War. IMAX's proprietary DMR (Digital Media Remastering) process allows conventional films to be upconverted into IMAX format. This special digital intermediate technology allowed films shot on 35mm for conventional theatres to be shown in IMAX venues. In 2002, Star Wars: Episode II – Attack of the Clones and an IMAX-format re-release of the 1995 film Apollo 13, were the first official applications of the DMR process. Because of the projection limitations at the time, Apollo 13 and Attack of the Clones had to be edited down from their original length. As IMAX updated the system and expanded the size of the platters, the later DMR releases did not have this limitation; current platters allow a run time of up to 175 minutes. Reviewers have generally praised the results of the DMR blowup process, which are visually and audibly superior to the same films projected in 35mm. But some filmmakers, such as producer Frank Marshall, point out that DMR blowups are not comparable to films created directly in the 70 mm 15 perf IMAX format, and that directors Ron Howard and George Lucas expected better. They note that the decline of Cinerama coincided roughly with its replacement by a simpler, cheaper, technically inferior version, and view DMR with alarm. IMAX originally reserved the phrase "the IMAX experience" for true 70 mm productions, but now allows its use on DMR productions as well. After The Lion King in 2003, no Hollywood studio engaged in re-releasing and restoring classic films through the IMAX DMR process until 2012 although ongoing conversion of new releases continued and continued to grow in number. James Cameron's Titanic underwent both 3D conversion and DMR conversion to 3D in 2012 as did Men in Black 3. In August 2012 IMAX and Paramount Pictures announced a one-week exclusive re-release of Raiders of the Lost Ark on September 7, 2012, to promote the release of the Blu-Ray collection. The film, before it underwent DMR, was already restored in a 4K digital intermediate with 7.1 surround sound from the original negative. The process for IMAX theaters, like with the complete restoration, was supervised by Steven Spielberg and sound designer Ben Burtt. "I didn't know if the 1981 print would stand up to a full IMAX transfer, so I came expecting a sort of grainy, muddy, and overly enlarged representation of the movie I had made years ago," Spielberg said. "I was blown away by the fact that it looked better than the movie I had made years ago." For other DMR releases and re-releases see List of IMAX DMR films. The Dark Knight features six sequences (a total of 28 minutes) shot using IMAX. According to the film's press notes, this was the "first time ever that a major feature film has been even partially shot using IMAX cameras". Even before Dark Knight, Nolan had wanted to shoot a film in the IMAX format, and he also used it for quiet scenes which pictorially he thought would be interesting. Nolan said that he wished that it were possible to shoot the entire film in IMAX: "if you could take an IMAX camera to Mount Everest or outer space, you could use it in a feature movie." Nolan chose to edit some of the IMAX sequences using the original camera negative to eliminate generation loss, while scenes that were digitally mastered where scanned and printed out at 8 thousand lines of horizontal resolution (8K). When the film opened in 94 IMAX venues in 2008, all of them were sold out for the opening weekend. A year later, director Michael Bay was inspired by IMAX's use in The Dark Knight to feature big-screen sequences in Transformers: Revenge of the Fallen. The film's co-writer Roberto Orci suggested that the IMAX footage would be 3D, but Bay later said that considering himself an "old school" filmmaker, he found 3D gimmicky and added that shooting in IMAX was easier than using stereoscopic cameras. The IMAX version of the film, in the end, contained almost ten minutes of IMAX-filmed footage out of the two and a half hour film. Bay later partially filmed the third Transformers film, Dark of the Moon in 3D but without IMAX. Bay returned to IMAX for the fourth film, Age of Extinction, in 2014. It was the first feature film to be shot using digital IMAX 3D cameras. Like with The Dark Knight, Christopher Nolan decided to film sequences of the sequel, The Dark Knight Rises, in 15/70mm IMAX. Nolan elected not to film in 3D and stated that he intends to focus on improving image quality and scale using the IMAX format. In a Hollywood record, The Dark Knight Rises featured 72 minutes of footage shot in IMAX (in comparison, The Dark Knight contained 28 minutes.) But because of the considerable noise made by IMAX cameras, 35mm and 70mm cameras had to be used for shooting the film's dialogue scenes, and dialogue had to be dubbed when shot with IMAX cameras. Chairman and president of the IMAX Corporation Greg Foster stated that IMAX plans to run the film in its theaters for two months, despite only being contractually committed to run the film for two weeks in some theaters. Adele's music video "Hello", released in 2015, became the first music video to be partially filmed with IMAX cameras. In April 2015, it was announced that Russo brothers' Captain America: Civil War would be the first film to use the new IMAX/Arri 2D digital camera, which was used to shoot approximately 15 minutes of the film. In May 2015, the Russo brothers announced that their upcoming films Avengers: Infinity War and the untitled Avengers sequel, scheduled for release in 2018 and 2019, would be the first feature films shot entirely in IMAX, albeit using the Imax/Arri 2D digital camera instead of 15/70 perf film. Rihanna 's music video "Sledgehammer", released in 2016, the second music video to use the new IMAX/Arri 2D digital camera. Many IMAX films have been remastered into HDTV format (cropped to fit into HDTV's 16:9 aspect ratio) for the MOJO HD, HDNet and HD Theatre networks and release on DVD and Blu-ray Disc. In July 2005 the BFI IMAX Cinema in London became the first to host live music concerts, using a digital non-IMAX projector. The Science Museum London and BFI IMAX Cinema have also hosted computer game tournaments using digital projectors. Several amusement park attractions have integrated IMAX film segments, including Back to the Future: The Ride formerly at Universal Studios in Florida and California, Horizons, formerly at EPCOT Center and Soarin' Over California at Disney California Adventure Park and Epcot. In late 2014, Dolby announced Dolby Cinema as an IMAX competitor with super-vivid image mainly in High Dynamic Range with shadow. ^ a b IMAX Corporation (July 20, 2016). "IMAX Corporation Reports Second-Quarter 2016 Financial Results" (Press release). PRNewswire. Retrieved August 9, 2016. ^ "Corporate, History & Milestones". IMAX.com. Retrieved July 3, 2010. ^ "Imax theater in Riverfront Park headed for demolition; fate of pavilion rides still in question". The Spokesmen-Review. September 30, 2016. Retrieved October 1, 2016. ^ "IMAX Corporation Form 10-K for the fiscal year ended December 31, 2007" (PDF). March 14, 2008. Retrieved February 29, 2016. ^ a b c Wilson, Mark (May 29, 2009). "How Regular Movies Become "IMAX" Films". Gizmodo. Gawker Media. Retrieved March 7, 2016. ^ "Phantom 65 used in the "Wild for IMAX 3D shoot". abelcine.com. May 2012. ^ "IMAX debuts digital 3D camera". tvbeurope.com. May 2012. ^ "Big Enough for Everest: Inside IMAX Sound". DigitalContentProducer.com. June 1, 1999. Retrieved July 3, 2010. ^ "The 15/70 Filmmaker's Manual" (PDF). Imax. Retrieved December 29, 2009. ^ a b Slater, Jim (December 2008). "IMAX Digital: It's IMAX, but not as we know it, Jim!" (PDF). Cinema Technology. pp. 38–41. ^ Roberts, Becky (October 2, 2015). "IMAX launches laser projection system in UK – and it looks spectacular". whathifi.com. Retrieved March 7, 2016. ^ "The Omnimax Theatre". Great Lakes Science Center. June 27, 1996. Retrieved July 3, 2010. ^ Simpson, Campbell. "Melbourne's IMAX Screen Is Now The World's Largest (Because Sydney's Was Demolished)". Retrieved October 4, 2016. ^ "IMAX – Precursors, Technical aspects, IMAX Dome/OMNIMAX, IMAX 3D, Viewer experience, History, Content, Technical specifications". Encyclopedia.stateuniversity.com. Retrieved July 3, 2010. ^ Tang, Calvin (August 15, 2010). "Interview with Underwater Filmmaker Howard Hall". AtlasOmega. AtlasOmega Media, LLC. Retrieved March 29, 2016. ^ "BLOG @ IMAX: Close Call". Imax.com. June 18, 2012. Retrieved November 7, 2012. ^ McClintock, Pamela (May 10, 2009). "Star Trek' beams up $76.5 million". Variety. ^ Vlessing, Etan. "Marvel's 'Avengers: Infinity War' to be Shot Entirely With Imax/Arri 2D Camera". The Hollywood Reporter. Retrieved May 7, 2015. ^ "'Captain America: Civil War' First to Use IMAX/Arri 2D Camera". IMAX. Retrieved April 29, 2016. ^ "Marvel's 'Avengers: Infinity War' To Be Filmed Using The IMAX/Arri Digital Camera". Marvel. Retrieved April 29, 2016. ^ "'Mission Impossible' To Open Early On IMAX". Paramount Pictures press release via Deadline.com. October 5, 2011. Retrieved October 27, 2011. ^ "Universal Pictures and Europacorp's "Lucy" Races into International IMAX® Theaters Starting August 8". PRN Newswire. IMAX Corporation. July 8, 2014. Retrieved August 3, 2014. ^ Lang, Brent (May 7, 2015). "'Avengers: Infinity War' to Be Shot Entirely With Imax Cameras". Variety. Variety Media, LLC. Retrieved March 7, 2016. ^ Mariella Moon. "Dolby is launching its super-vivid IMAX competitor in the Netherlands". Retrieved December 7, 2014.